The monastery of La Verna in Tuscany, Italy, was built on the clifftop site where St. Francis received the stigmata. It is a gorgeous little monastic hamlet (top) with simple rooms (middle; not pictured: my decor, which consisted of a crucifix above the bed) in a special guest wing of arcaded Renaissance corridors (bottom).In the autumn of 1224, on a mountain in the Casentino hills between Florence and Arezzo, the monk the world would soon know as St. Francis was praying in a cave. Suddenly, a heavenly seraphim appeared and bestowed upon him the holiest of all saintly afflictions: the stigmata, miraculous wounds replicating those suffered by Christ on the Cross. This scene, which sealed Francis's saintliness, has been reproduced in countless frescoes and altarpieces across Tuscany. The story has drawn pilgrims and tourists, the faithful and the merely curious, to the Santuario della Verna monastery that sprang up around the miraculous cave between the 13th and 15th centuries. La Verna remains a place out of time, a cluster of medieval stone buildings perched atop a forbidding cliff often shrouded in morning mist. Time is measured by the silent processions of white-robed monks. They make their way silently though the stone streets, on their way to sing the calls to hours (guests are welcome to attend) in a main church and a dozen chapels decorated with blue-and-white glazed terracotta sculptures by the famous Renaissance della Robbia clan. Visitors—of any faith, or none—are welcome to stay in the Foresteria. The 72 guest rooms along arcaded cloisters and adjacent halls are as austere as you'd expect—tiny chambers with formica floors, aging modular furnishing units, and a crucifix on the wall—but each is heated and comes with a tiny private bathroom. 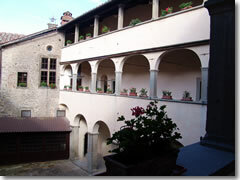 Web: www.santuariolaverna.org (Italian-only; click on "Accoglienza"). All meals are included with your stay, and dinnertime puzzles the guests together randomly at tables so small you’re forced to make conversation, which is part of the point. You might dine with a young Italian Catholic staying for devotional purposes, a transcendental spiritualist who came for the meditative atmosphere, an American protestant fascinated by pilgrimage sites, and an avowed atheist curious about the anthropological side of people who stay in monasteries. Conversations tend to be wide-ranging, and frequently turn to religion, but the gentle spirit of St. Francis seems to prevail above polemics. Visitors usually seem intent on sharing thoughts on faith and discussing the differences between their firmly held beliefs without condemnation or attempts at conversion, merely a desire to understand other points of view—and to get a glimpse into the ancient monastic lifestyle recounted in countless medieval frescoes wallpapering Italian churches. 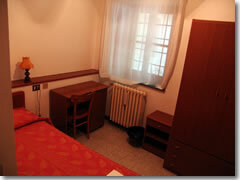 What is it like to stay in a monastery in Italy? What are the rooms in a monastery like? 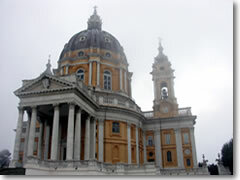 The wildly rococo Basilica di Superga, designed by Filippo Juvarra and a scenic cog railway ride above the city of Torino in Italy's Piemonte region, is run by the Servi di Maria (Servants of Maria) lay order, and has a hostelry which will put up guests for €25 a person ((+39-011-899-7456, www.basilicadisuperga.com)(Also all Italian)) Monks live in simple cells, and you should expect the same: modular furnishings, narrow beds, and a decorative scheme heavy on Jesus and the Virgin Mary. You sometimes have to share a bath down the hall—but also often get to share home-style meals, either with fellow travelers or with the monks themselves. Accommodations may be in a special wing of the monastery complex set aside for visitors, or in a dorm-like room of bunks, or even an unused monk's cell. What's it like to stay in an Italian monastery? Though pilgrims predominate, guests of all faiths (or none) are welcome. You are usually invited, though not required, to attend services and the calls to hours in the chapel. There are plenty of rules: respect the monks, be fairly quiet, arrive for meals promptly, check in and out at the appointed times, and be back in your room (or at least in the guest wing) by curfew, which may be as early as 9:30pm. In exchange for all this, you get a cultural exchange program at bargain-basement prices. Regardless of your own religious persuasion, this is an unparalleled opportunity to sample a bit of the monastic life and experience the quiet, reflective solitude of strolling the cloisters and gardens. If nothing else, a monastery stay can be a welcome break from the hurly-burly of touring endless museums and cathedrals. How much does it cost to stay in a monastery? Though most religious hospices charge a modest fee of €20 to €60 per person (but note that that fee usually includes at least two meals, breakfast and dinner, and often lunch as well), many monasteries will take in travelers absolutely free of charge. This is because several monastic orders take "hospitality" as one of their rules, along with their vows of poverty and charity and the like. 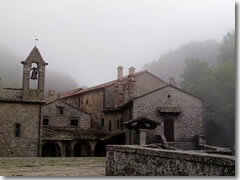 Where can I find monasteries in Italy? Monasteries are rarely found in the big cities—unlike their sister pilgrim lodgings, convents, which are often in towns (especially Rome and Assisi). They tend to be tend to be isolated out in the countryside, in mountainous or rural areas more suited to a monk's life of contemplation. This can add to the triple benefit: a cheap (or free place to sleep, a unique cultural experience, and a chance to get off the tourist treadmill of Europe's major capitals and into the woods or small town to which the monks have retreated. Ask local tourism offices; do lots of Googling. Hospites.it (www.hospites.it) is a fairly complete, but confusing, site with more than 3,000 listings. The "English" version really only gives you field names in English; the drop-down menus are still all in Italian. Here's what you need to know: Under "kind" try each of: "casa di accoglienza," "foresteria," "casa per ferie," and "casa vacanze." Good Night and God Bless (www.goodnightandgodbless.com) - Trisha Clark, author of the guidebook described above, also runs a website with links to hundreds of monasteries and convents that take in guests. A list of monasteries, abbeys, and convents in Italy (www.novena.it/conventi/conventi_eremi_abbazie.htm): Not necessarily up to date, and all it provides are names, addresses, and phone numbers (and not all welcome drop-in visitors; many are really only open to those seeking a longer spiritual retreat, not just a night or two's accommodation), but a pretty exhaustive list. Several major monastic and conventual orders list retreat programs and guesthouses online, including the Benedictines (www.osb.org) and Dominicans (www.op.org). Zefiro World (www.go-to-italy.com/English/Religious.htm) - Has a line on around 60 monasteries and abbeys converted into hotels across Italy. Unfortunately, most of these are upscale hotel operations, not cheap dorms for pilgrims.